The Dream Tree project was inspired by some art work created by my son Austin when he was eight years old. He called his picture "The Dream Tree". I'm a dreamer and I loved this picture the moment I saw it. I also love encouraging children to use their imaginations and follow their dreams. Today Austin is 20 years old and in his second year of Art School and he continues to inspire me as I watch him use his gifts and follow his dreams. I've written some new songs for this project that I hope will inspire your children as they begin to follow their dreams. There are also songs about trees and gardens and things that grow (like our gifts and dreams) and some things that help us grow. There are a few silly songs too just for fun! Order Your Copy... get a FREE T-shirt! The Dream Tree CD and The Dream Tree T-shirt is available to ship now! Order your CD today and get a FREE Dream Tree T-shirt while supplies last. 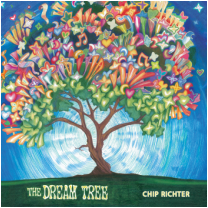 Check out this video with Chip Richter in the studio talking about about the Dream Tree project. This video was part of Chip's Kickstarter Campaign that was a huge success thanks to all the friends and fans who participated.